Domaine Serene, the award-winning pinot noir and chardonnay producer located in the Dundee Hills, is making news again by expanding its successful Domaine Serene Wine Lounge concept to Lake Oswego. The company has secured 5,000-square-feet in The Windward, the upscale retail and luxury apartment development located in downtown Lake Oswego. The space is located at the corner of First and Evergreen, across from Millennium Park Plaza. Construction will begin soon and the wine lounge is slated to open in the fall. It will feature a full kitchen serving lunch and dinner along with wines from Domaine Serene and Chateâu de la Crée and Maison Evenstad in France. "We have seen great success with the opening of our first wine lounge in Portland at the Sentinel Hotel and felt compelled to create a second truly elevated, wine-centric experience for our members and wine lovers in Lake Oswego," says Ryan Harris, Domaine Serene president. "The newest Domaine Serene Wine Lounge will be a cutting-edge wine and restaurant concept in Lake Oswego, home to many of our top wine club members and brand ambassadors." The menu creation and culinary program will be directed by Executive Chef Athena Delgado. She has experience at Michelin three-star-rated restaurants around the world, including Restaurante Martin Berasategui and Quique Dacosta Restaurante in Spain and with Joel Robuchon at the MGM Mansion in Las Vegas, followed by four years at the Aria resort as sous chef at Jean Georges Steakhouse. Most recently, Athena was the executive sous chef at Aureole, also in Las Vegas. As both a chef and sommelier, Delgado is excited to take the helm as executive chef of Evenstad Estates, where she will oversee the culinary program for The Clubhouse at Domaine Serene, and the Domaine Serene Wine Lounges, both in Lake Oswego and Portland. "I'm honored to assume the role of executive chef for Evenstad Estates. Our range of wines, including Burgundian offerings from Chateâu de la Crée and Maison Evenstad inspired me to come to Oregon. Working here gives me the ability to work with some of the finest wines in the world in harmony with a wide variety of local ingredients," Delgado said. "I look forward to creating a memorable experience for customers by tapping into the unique terroir of the Willamette Valley and everything that it offers, including world-class wines and fresh, farm-raised ingredients." In true Domaine Serene style, a dream team will bring the concept to life. Construction will be handled by Schommer and Sons, who recently received a Build America Award and national recognition for the most impressive construction project of 2017 for The Clubhouse at Domaine Serene. The inspiration of The Clubhouse was taken from Chateâu de la Crée, Domaine Serene owners Grace and Ken Evenstad's 15th-century estate in Santenay, Burgundy. It's design, architecture and old-world construction techniques lend the same sense of place and history of the Burgundy winery, and features a food and wine pairing lounge wrapped by a large patio that frames sweeping views of the Valley and the Coast Range. The design and aesthetic for the new Domaine Serene Wine Lounge is being led by GBD Architects of Portland. 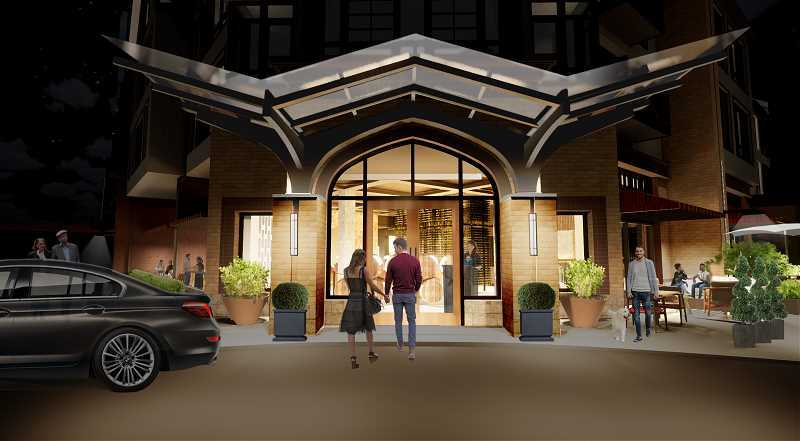 Once completed, the Domaine Serene Wine Lounge in Lake Oswego will be centered around a floor-to-ceiling glass wine tower that displays over 3,500 bottles of wine. Textural elements of stone, glass, wood and leather will round out the ambience. A wine library will feature a limited number of personal wine lockers available for VIP members. The locker area and library space can be partitioned off and booked for private member parties, business meetings and events. A stage area will flank the dining room and adjacent lounge and will feature musical artists. Entertainment will be booked throughout the week and will offer guests the opportunity to enjoy local and touring musicians while sipping their favorite wine. There will be seating for over 100 people in a variety of settings. "We're thrilled to welcome the Domaine Serene Wine Lounge to The Windward," said Kim Wizer, owner representative at The Windward. "Domaine Serene's award-winning wines, culinary offerings, and entertainment will bring a truly amazing experience to Lake Oswego. The Domaine Serene Wine Lounge will complement the best-of-class retail and restaurant tenant mix we're cultivating at The Windward and in our community." Kathleen Healy and Ashley Heichelbech with Commercial Realty Advisors, the commercial leasing brokers for The Windward, agree. "Having Domaine Serene anchor the southeast corner of The Windward retail is a very exciting development for the project, and community of Lake Oswego. The Domaine Serene brand is extremely well respected locally, regionally, nationally, and even internationally — this is a real win. Domaine Serene marks the 12th commercial tenant to announce at The Windward, and enhances an already successful mix of current tenants (all doing very well). We look forward to making more announcements soon," the women said in a statement to The Review. Come fall, the new space will be open to the public and wine club members daily for lunch and dinner with brunch on Sundays and will include weekly rotating wine flights, rare wines by the glass, and bottles for on-and-off premises consumption. Finally, a small wine boutique, featuring chilled offerings from Domaine Serene and Evenstad Estates is located near the front door to take home and enjoy, even if you aren't dining at the Wine Lounge. "We want this to be a unifying experience," Harris said. "It's not just wine, it's not just food — one enhances the other. The Wine Lounge will elevate your experience. Our goal is to create a warm and welcoming place to gather in Lake Oswego." He said the Wine Lounge also will have a full bar and offer wine cocktails. "We want everyone to have something they enjoy," he said. "Perhaps they aren't wine enthusiasts yet, but they can enjoy something else instead." In addition to live music expect wine education classes, themed events and special tastings. Private parties are welcome to book special events as well. Grace and Ken Evenstad settled in the Northern Willamette Valley in 1989. Their spirit and passion to produce wines that rival the great wines of Burgundy, France, led them to purchase and plant a hilltop estate that had just been logged in the Dundee Hills. Today, Domaine Serene produces wines from six vineyard estates, planted exclusively with pinot noir and chardonnay. In Oregon, the Evenstads own nearly 1,000 acres of land in the hills of Yamhill County, with 275 acres planted to vine. Working every job in the winery for many years, the Evenstads built Domaine Serene from the ground up with a focus on producing high-quality wines through innovation and a focus on excellence. The Evenstads have gained a true appreciation for the attention to detail required to make exceptional wines. In 2015, the couple fulfilled a lifelong dream of producing wine in Burgundy, France, by acquiring Chateâu de la Crée, the respected wine estate located in the birthplace of pinot noir and chardonnay: the renowned Cote d'Or. They own 25 acres of prime vineyards in Pommard, Volnay, Meursault, Puligny-Montrachet, Chassagne-Montrachet, Santenay and Maranges. This made them the first Oregon-based vintners to own land and produce wines in Burgundy. In just under three decades, the Evenstads have propelled Domaine Serene onto the global stage as one of the world's most acclaimed and respected wineries. Domaine Serene's wines represent the achievement that is possible in Oregon, one of the finest regions in the world for pinot noir and chardonnay.